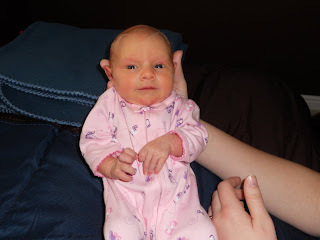 Kassidy Cori Morrison was born February 17, 2011 at 11:47 PM. She was 6 lbs 4 oz and 17 inches long. She is a good little baby, although we are currently battling her first cold. I can't believe my two week old baby is so sick. We went to the doctor tonight, and she told us to keep a close watch on her all night, so it is currently my shift, so I decided to finally update my blog. Here we are, me and the babe, after about 7 hours of labor. So, as I am getting hooked up to monitors, being asked a million questions, and settling into my birthing suite, a nurse comes in and says, "Did you know Dr. Ward is out of town?" This news was both shocking and unnerving, because I knew that Lakeview Hospital required a doctor to be present for my entire labor, since I was attempting a VBAC (Vaginal Birth After Cesarean). After informing me that I was dialated to a 4 and that things were moving along nicely, the nurse excused herself to go call the backup doctor. About 10 minutes later, she came in and gave me two options: have a c-section in an hour, or go to another hospital to attempt a VBAC. 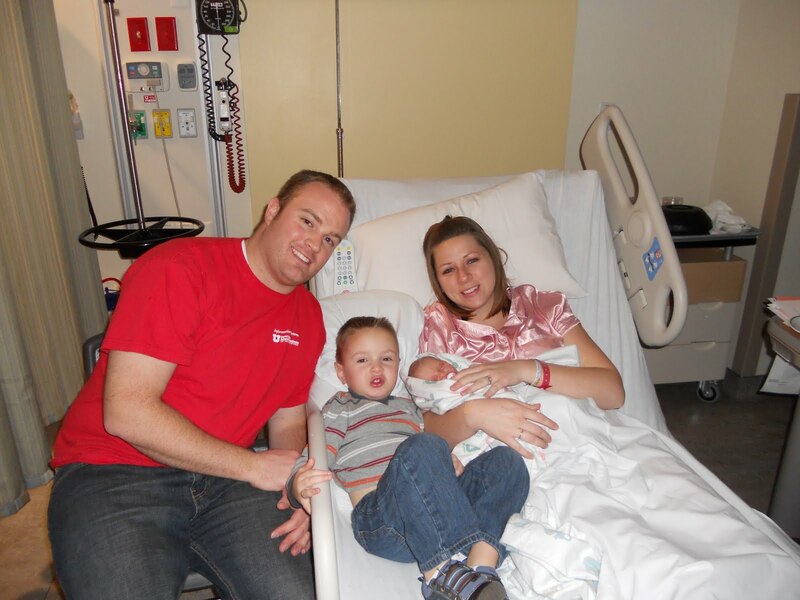 The backup doctor was already at LDS Hospital delivering another baby. So, at about 7 PM, we were cruising on up to University Hospital. I was very upset at this point, and in quite a bit of pain. I was sure it was going to be a horrible experience, that I would just be pushed to the side, since I didn't have a doctor and was a transfer patient. When we first got to the hospital, that is exactly what I felt like. I was put in this random room in the middle of a construction area, and was told someone would be in to check to see if I was "really in labor" before officially checking me in. About an hour later, they confirmed that I could stay, since I was dialated to a 6 and in quite a bit of pain. 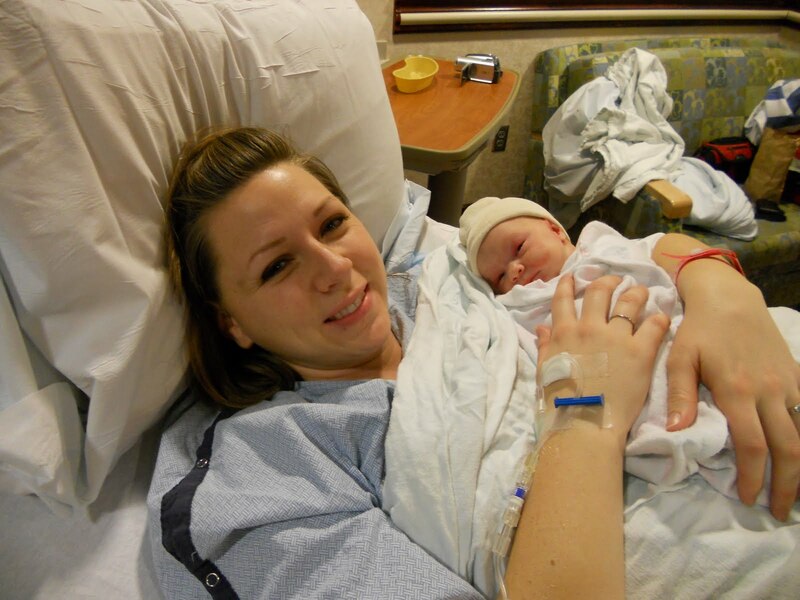 At 8:40 PM, I was finally taken to my delivery room. There I was greeted by the best nurse ever, who I later learned was the sister to my friend Chris. I requested an epidural at that point, since I was not liking the pain anymore and was dialated to 7. My nurse paged for my epidural and labor continued...painfully continued for another hour and a half without the epidural. As I started getting louder and less patient, my nurse went out looking for my pain meds. Turns out, the paging system was down exactly when my request was sent. So, at about 10:15, I got my epidural. It took forever because my contractions were 1 min apart at this point. I was dialated to 8. Wow. Don't really want to go through that again. I almost broke Dustin and my poor nurses hands. It was rough. So, I finally get the epidural, my parents came in to say hi for a minute, and I was hoping to relax for a bit. Doctors kept popping in and having me roll to my right side, then my left, put oxygen on me, all for baby. Her heart rate kept dropping, and they were quite worried about that. So, at about 10:45, a doctor came in and asked if we could check my progress. So, out went my parents again, they checked me, and I was fully dialated. So, everyone was like, okay, we are ready to push! I was not ready to push! I was finally feeling good for a few minutes! Here we go. All the sudden my room was filled with about 8 doctors. It was crazy! I pushed for about 45 minutes, and they were really worried about the baby's heart rate and I was bleeding more than normal, so they informed me that they would be using forceps to assist me. This completely freaked me out! So, next contraction, I got to push with forceps. This was not fun. So painful! They took the forceps out, I pushed one more time, and she was out! She screamed right off and was a healthy, beautiful baby. Luckily, she had no marks from the forceps. Overall, my experience was so good. The doctors were so great, and my nurse was amazing. So, that is the story, sorry it was so long!! Our family. 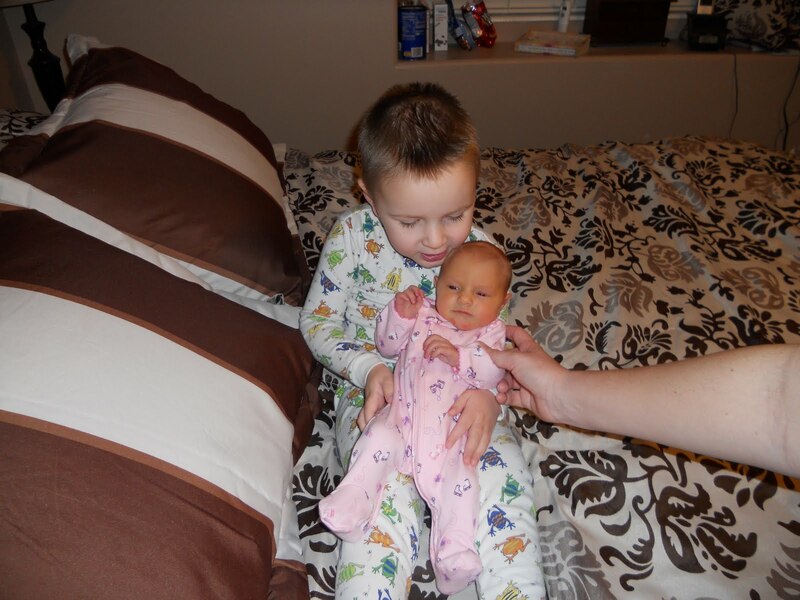 Camden loves his new baby sister so much. He loves her too much, hence she got his cold. He can't keep his hands to himself. He is always trying to hold her and kiss her. He is a good little helper. This is what Camden and Dustin were doing the first day we were all home together. 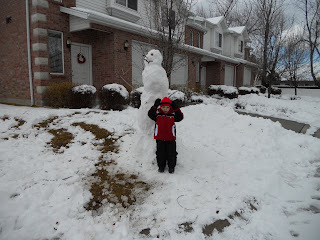 Cute snowman! My cute kids in their PJs! Just had to document that these are preemie PJs. She is so tiny! Especially compared to Camden who was 8 lbs 5 oz and 21 in! And had to include this one... first unofficial semi-smile. She is such a sweet baby, and we love her so much!! 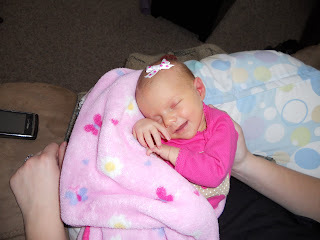 Hopefully this illness will pass quickly, and we can get back to enjoying our sweet, happy baby! Our last few exciting months!! We went to San Diego for a little girls getaway...Camden joined us and was certainly the little ladies man!! It was such a fun trip, and we got to enjoy a little bit of the beach and the sunshine! Camden loved the beach and the BIG water, as he called it. Didn't know how he felt about the cold water at first!! 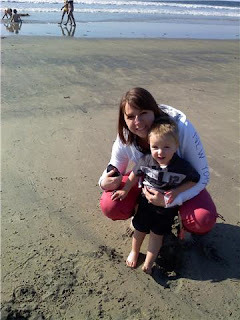 Camden and Deb had so much fun playing in the water and running up the sand. Camden and Grandma Cori...his shorts and shirt were soaked by this time, so he was down to his onsie and jacket. 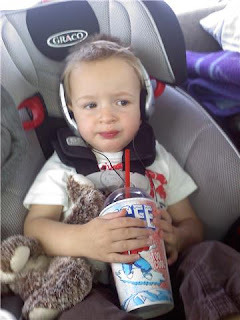 He got to watch movies and even enjoyed an icee!! It was windy and freezing, so we didn't get to do as much hiking as we wanted, but we did see some beautiful views. Camden looks so much like Dustin in this picture!! If you can't tell, that is a hotdog in Camden's hand. He loved roasting hotdogs and marshmallows over the fire! Our trip was fun. However, the BEST part of the last few months is that Dustin finished his last semester at the University of Utah and GRADUATED!!! He got two degrees in Information Systems and Finance. We are so proud of him and it was such a fun and exciting day!! CONGRATS DADDY!! WE LOVE YOU AND ARE SO PROUD OF YOU!!! To celebrate Dustin's graduation and our five year anniversary, we went to Las Vegas. We had a lot of fun and enjoyed the warm weather!! This is the one picture we took! We didn't do very well documenting our adventure, but we had a lot of fun. Stay tuned...Camden turned two years old on Saturday, so another post will be following with all those fun pics. Wow, it has been so long...five months to be exact!! Here is an overview of our life in the last five months. There are a lot of pics!! We are all doing well. Dustin is in his LAST semester of school!! We are SOOOOOOO excited and can't wait for it to be over...but at the same time, when he graduates, our baby will be two years old! I really can't believe that and am not really looking forward to it. Speaking of my "baby", he is so much fun. He has such a funny personality and we have so much fun with him. He says everything and copies everything we say. It is not always a good thing!! He is putting words together more and more everyday. It is amazing to watch how much he learns everyday. Each time we read books, he says more and more. He has the last word of the page memorized in all his bedtime books. It is so cute. He "reads" along with me. 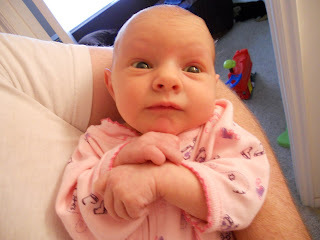 He has also started repeating what I say when I pray. It is the sweetest thing ever!! I love watching his mind grow and develop. With his big personality comes a big attitude, and lately his favorite word is "No". That is not so cute... He also refuses to eat unless he is feeding himself, so most meals end with a frustrated mommy, a huge mess, and a hungry Camden. He is very defiant. He also never stops, and my only sanity comes from Mickey Mouse Clubhouse and sleeping time!! I love being a mom and hanging out with my little buddy. He brings me so much happiness and we laugh a lot together. We went to Vegas in September and ate at this awesome restaurant called Hash House A Go Go. The portions were HUGE!! You can't even tell by the pics. Camden's pancake was as big as him! At the fair, Camden rode a horse for the first time!! He wasn't so sure about it, but he had fun. Camden loves to read. He would read all day if I were a better mommy. When I won't read to him, he sits down and reads by himself. So cute! Camden walking around, eating his banana. Last Zoo excursion. Camden rode the zebra on the merry-go-round, and loved it!! Christmas...My handsome boy!! He looks so grown up in these first two pics. Unfortunately, we haven't taken many pics since Christmas. Here is Camden with Daddy's hat on. He loves to mess up his hair, especially right before church! Well, since it has again been several months since I posted anything, here are a few pics from our summer. He didn't know how he felt about the sirens! We went to the Bees game with our friends Ryan, Paige and Henry. Camden chowing down on kettle corn. He had to get it from the bag himself.